The NFL season is officially upon us. Going to watch a football game in person is an experience every fan should try at least once. However, one time might be enough these days. Technology has made the home-viewing experience so enjoyable that many fans actually prefer staying home rather than spending a small fortune getting out to the stadium. The yellow first-down line that first appeared on our TV screens back in 1998 was just the beginning for the home-viewing experience. With the NFL season underway, let’s take a look at how technology is changing how we view sports for the better. The quality of TV broadcasts keeps getting better, with HD now the standard and 4K becoming more and more prolific. To coincide with those improvements, TVs are getting both bigger and cheaper. For just a few hundred dollars, anyone can buy an excellent TV. That’s not much of a price difference than the cost of a couple of tickets for the game. A nice 40-inch TV is just the tip of the iceberg. More extreme fans can get ahold of enormous outdoor screens and set up entire viewing areas and man caves. A big TV screen is nice enough, but so is being able to watch the game on the go. All the major sports offer special packages that let you watch games on the go with mobile devices. It’s not the ideal way to watch a game. 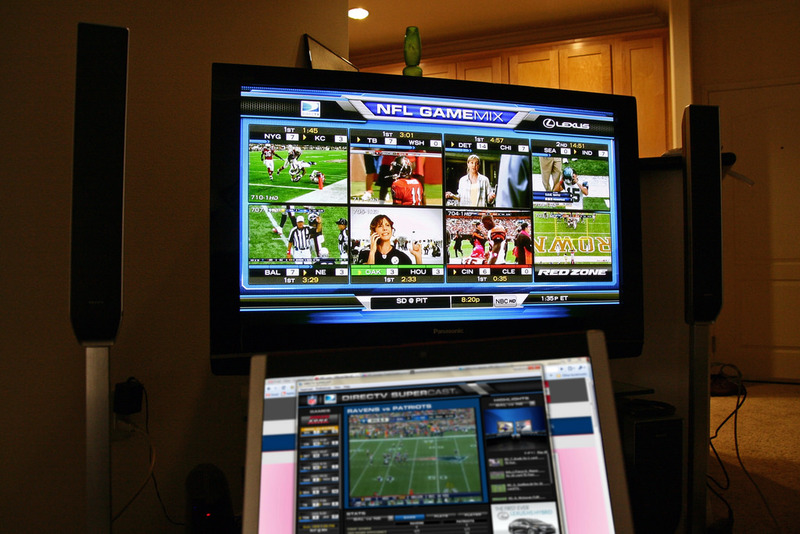 However, the flexibility of being able to watch anywhere allows sports junkies to get their fix. These packages can be pricey, yet they offer unprecedented access to every game. Doing that on regular cable TV is simply impossible. You’re in a stadium and just witnessed one of the most incredible plays of all time. The big screen will likely show the replay a couple of times, and that’s it. Now compare that to the home-viewing experience. Thanks to DVR technology, you can watch replays as you see fit. A minuscule play – such an offensive lineman successfully blocking a defensive end or a defensive back jamming a receiver at the line – can be meticulously studied as if you were the coach. Such scrutiny isn’t for everyone, yet DVR technology has allowed us to watch the games on our terms and not at the mercy of broadcasters or the jumbo screen at the stadium. Those packages that let you watch games on the go are just one of the uses. Thanks to the rise of smart TVs, cord cutters can ditch cable but still get most of their games by streaming them over the internet. This is something fans are totally on board with. In 2015, Yahoo nabbed the rights to broadcast a relatively insignificant game between the Buffalo Bills and the Jacksonville Jaguars. That less-than-premier matchup nabbed an impressive 15 million users and showed the future of watching sports. There will always be the desire to attend games live to cheer on your team and boo their opponents. However, technology makes it all the more appealing to stay at home.